A New Hanover County tradition since 2005, guests from around the world have visited Airlie Gardens from Thanksgiving to Christmas to take in the sparkling sights and festive sounds of the season. 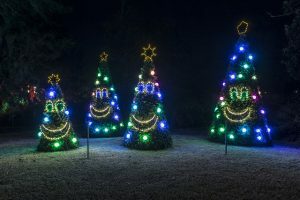 Guests will experience a 0.5m stroll through the Gardens, on a self-guided walking tour while feasting their eyes on a spectacular array of lights and holiday displays. Also in attendance, Santa Claus himself, and a few local food and beverage vendors with coffee, hot chocolate, popcorn, cookies, beer, wine and more! Tickets often sell out in advance so reserve yours early! Questions about the event? Click HERE to check out our FAQ page!